DISNEY PIXAR CARS. I check it often and will get back to you as quickly as possible. 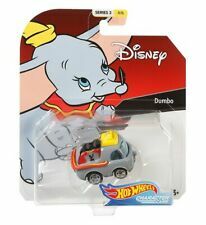 1/64 Character Car- Dumbo. Each vehicle has been an enduring favorite of collectors and racing fans of all ages. Choose your favorite and collect them all or pick and choose from different collections to create your very own! I will send an invoice once I receive the request . Do not dismiss your dream. Mack Truck Size(L x W x H): Approx 24cm x 4cm x 6cm. It is perfect for collector's display and also can be used as a toy or gift! The small car is can be put into the Truck to play（Maybe one or two cars are not suitable）. CAM SPINNER TRIPLE DENT NEXT-GEN PISTON CUP RACERS 2019. DISNEY PIXAR CARS. I check it often and will get back to you as quickly as possible. Trending at $5.95eBay determines this price through a machine learned model of the product's sale prices within the last 90 days. Easter Mater. Disney Pixar Cars Easter Series. Easter Tire Basket Included. I check it often and will get back to you as quickly as possible. Loose Condition. We believe communication will fix problems. Size: 1:55 Scale. A Squinkie is a cute little 1" tiny toy. You would then put your Squinkies back inside their plastic shells, put the shells in the gumball machine, and twist the knob to make them roll out one by one. SUPER CHASE BIZ TORQSEN SCAVENGER HUNT 2019. DISNEY PIXAR CARS. Rev up for thrilling stunt and speed action with this bundle of Disney/Pixar Cars fun that includes the Piston Cup Playset and 4 favorite character vehicles (Lightning McQueen, Mater, Mack, and Pitty). This is a Disney Scene It? 2nd Edition DVD Board Game Metal Tin holographic 100% Collectors Complete. Condition is Used. Contains all the pieces and instructions. Everything with the game is in good-great shape. Shows minimal use. Shipped with USPS Priority Mail. Sold as is. No returns. FABULOUS LIGHTNING MCQUEEN FLORIDA 500. DISNEY PIXAR CARS. I check it often and will get back to you as quickly as possible. Description: 100% Brand New and High Quality It is perfect for collector's display and also can be used as a toy or gift! The small car can be put in the Truck to play!. MATER WITH HAT FLORIDA 500 2019. DISNEY PIXAR CARS. 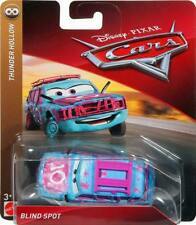 Disney Pixar Cars 3 Thunder Hollow Todd Krash. HTF Brand new. Package is in nice condition! This is from the newest case. Only one per case. Refer to pics as they are part of the description. Email with questions or concerns. Internationally shipping okay. Be sure to check out my other cool auctions! I have a lot of toys! Thank you! 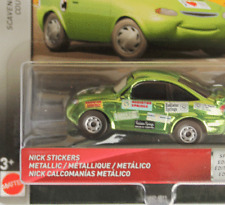 Diecast vehicle based on the characters in the popular Disney/PixarCars films! In 1:55 scale! If the item is delayed or loss we will not be able to locate it. 1:55 Scale. 2019 Disney Pixar Cars 3/Andrew Vrooman -- The Cotter Pin. Nice card. Trending at $15.95eBay determines this price through a machine learned model of the product's sale prices within the last 90 days. Disney Cars 3. I have two. Size : Mack Truck: Length Approx. 21 cm, Height Approx. The King: Length Approx. 9 cm, Width Approx. A great gift that any kid will love it. All products are quality checked. We will be happy to resolve any issues you may have in a cordial and friendly manner. BILL REVS THE COTTER PIN 2019. DISNEY PIXAR CARS. I check it often and will get back to you as quickly as possible. Car is new in sealed packaging. Packaging has some bends, creases on cardboard and dings in plastic Please see images for examples 2 Paint jobs in 1 - Changes colors with warm or cold water . DISNEY PIXAR CARS STEVE HEARSELL FLORIDA 500 COLLECTOR GRADE CARD FREE SHIPPING. Condition is New. Shipped with USPS First Class Package. All products are quality checked. Size : Length approx. Triple your Disney/Pixar Cars 3 action with this Florida Speedway Garage! Just pull to expand the set high and then send the included Lightning McQueen vehicle racing down the ramp. You can also connect the Florida Speedway set to have the champ race on to the film’s epic new course! "CHASE RACELOTT.A.K.A. VITOLINE ". DISNEY PIXAR CARS 3. I apologize for any inconvenience this may cause, and appreciate your assistance in helping us do better. DISNEY PIXAR CARS 3 NEXT-GEN RACERS 4-PACK Target Exclusive. Brand New In Box. Condition is New. Shipped with USPS Priority Mail. Size : Mack Truck: Length Approx. 21 cm, Height Approx. The King: Length Approx. 9 cm, Width Approx. A great gift that any kid will love it. Do not run through your life so fast that you forget not only where you have been, but also where you are. BOB CUTLASS NEW LOOK FLORIDA 500 2019. DISNEY PIXAR CARS. I check it often and will get back to you as quickly as possible. Paddy O With Rubber Monster Tires - Loose. Great car for the Pixar Fan. I check it often and will get back to you as quickly as possible. Great to bang and crash. NICK PIT-TIRE NIGELS PITTY WGP 2019. DISNEY PIXAR CARS. I check it often and will get back to you as quickly as possible.